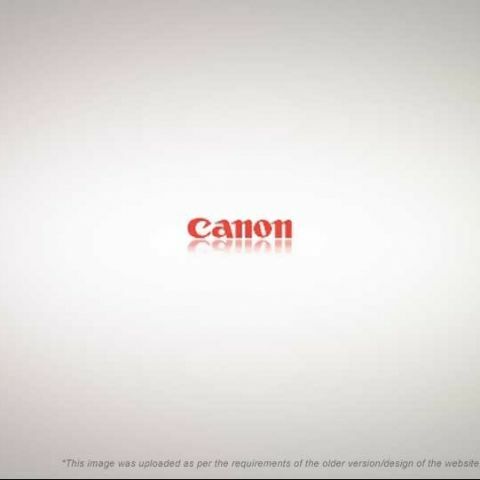 Canon India Pvt. 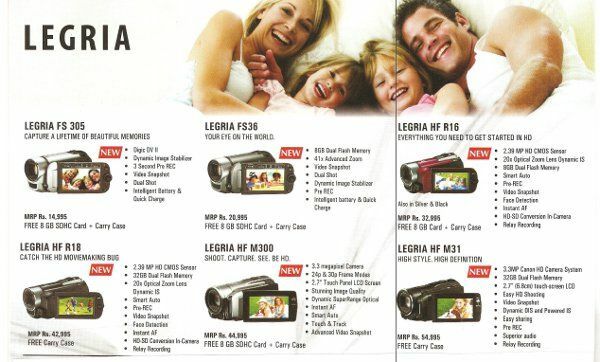 Ltd., India's No.1 digital imaging company today unveiled a wide range of 20 next-gen digital cameras and DV camcorders targeting its Imaging and Communication Product division in the market. 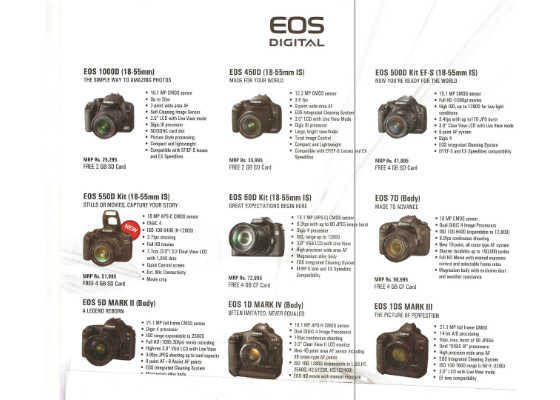 The launch highlighted 5 cameras in the PowerShot range, 3 cameras in the IXUS range, 6 high-definition and 2 regular (non-HD) camcorders along with the most anticipated EOS 550D digital SLR with three high quality lens versions and two Pro DVs. 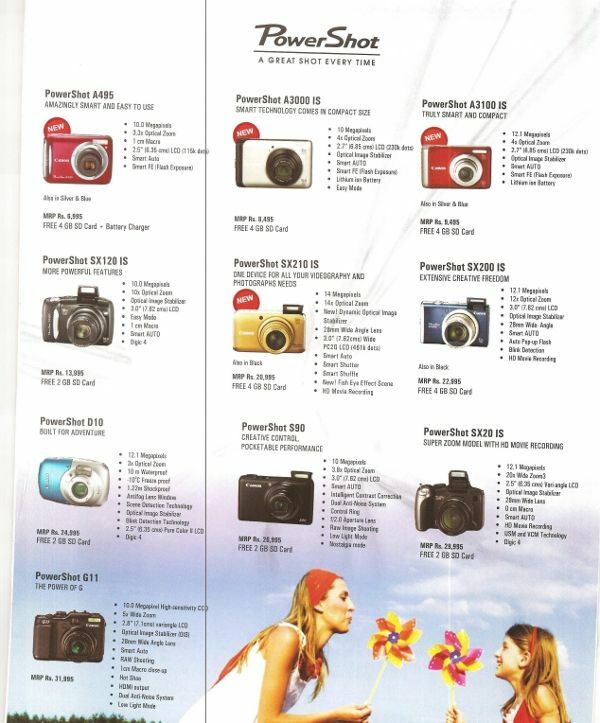 With this launch, Canon has expanded its range of digital cameras, camcorders, D-SLRs to 42 in total. Canon plans to expand its marketing business for 2010 by investing Rs.55 crores towards the marketing funds. Mr.Kensaku Konishi, President & CEO, Canon India addressing the media on this auspicious occasion said, “We, at Canon, are very proud to offer our customers an expanded portfolio of cutting edge technology of advanced, stylish, sleek and professional cameras and camcorders. Canon, with its heritage in digital technology is at the forefront of simplifying user experience and with our newly launched products we plan to take customer experiences to the next level. 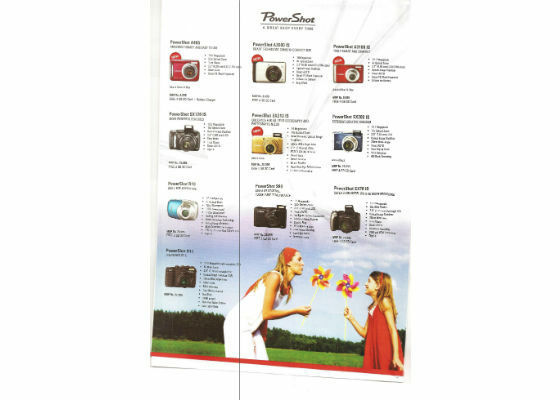 Our new product range, launched today provides supreme technology cameras for all users to help click their best Canon shots”. Mr. Alok Bharadwaj, Senior Vice President, Canon India spoke exhaustively regarding the latest innovative technologies being implemented in their new range of PowerShot and IXUS digital cameras. He said, “Our intuitive intelligence technology is getting smarter. Smart flash exposure and smart shutters are new additions to smart auto technology. Even a child can now create “fish eye” effect and “blurr” effect while capturing images, giving an artistic feel to the art of photography. Household penetration of cameras is low but growing in Indian homes. Our DSLR business has grown to become 10% of total camera business, thanks to the rapidly emerging photo enthusiasts”. He further added, “Canon technology advances in wide angle, high optical zoom, faster processor and high definition video capturing features with sleek looks and wowing our customers”. Canon intends to constantly aim at introducing creative and innovative technologies for its customer base worldwide and enrich them with memorable photographic experience every time. The latest launch of its 14 megapixel next-gen camera, the Canon IXUS 210 is expected to provide amazing camera experience with its state-of-the-art 3.5-inch touch screen, which promises to allow users to ease through the navigation menus with the touch of a finger. It is said that users could also scroll through pictures using this interface with ease or alternatively tap the sides of the camera to scroll between shots. It also seems to have an option of tagging pictures using the touch screen, as well as deleting and rotating images. The feature rich 14 megapixel camera promises to provide a photo enlargement option where one can re-size a photo to poster sizes. 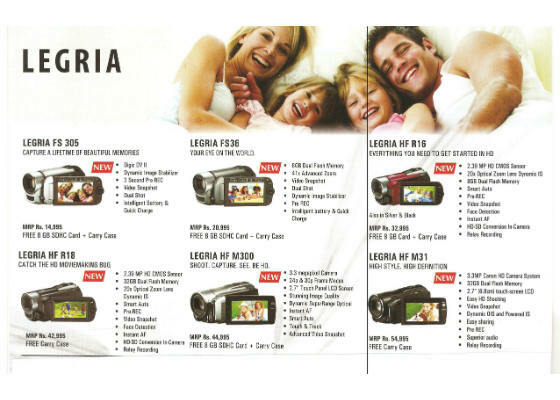 Canon also revealed its soon-to-be-released television commercial, “My IXUS, My Style”. 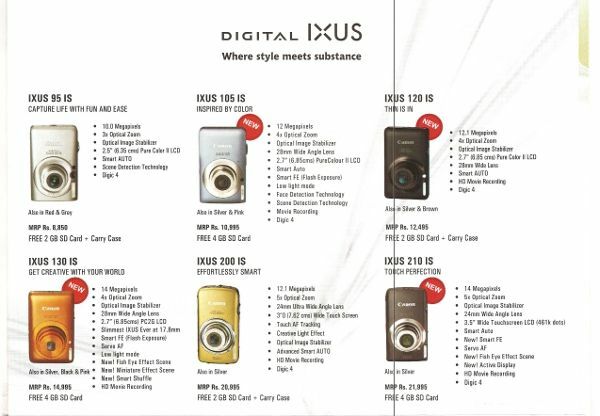 The IXUS range with technologically advanced, sleek and stylish designs is targeted towards trendy and fashion conscious consumers, who have a distinct taste for highly compact and super-sleek form factor. The TV commercial is proposed for this month end launch and is primarily focused on youth. With its renewed effort to delight customers with cutting edge technology, Canon has also announced its entirely new range of eight High-Definition and Standard Definition camcorders. The latest from their production stable FS305, is the lightest, smallest digital camcorder produced by Canon. 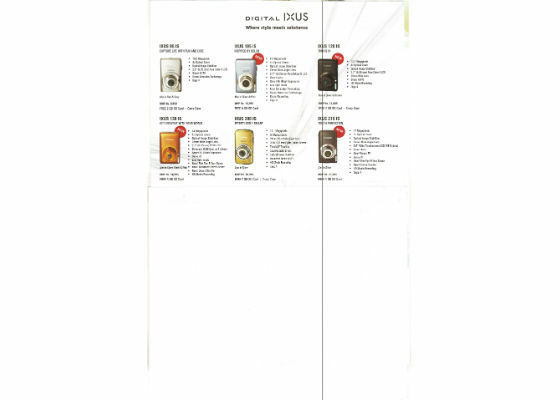 Thus, its high portability makes it a great companion throughout the user's daily routine. FS305 is equipped with the processing power of DIGIC DV II processor and the optical precision of Canon video lens to deliver an advanced zoom range up to 41x. With the capability of recording movies straight to SD or SDHC memory cards, it appeals as a highly portable and an ideal sharing device. The other exciting camcorder models that were unveiled today are: FS 306, HF R16, HF R18, HF M300, HF M31, HF S200 and HF S21 with high quality image sensors to capture life with a click of a button. On this auspicious occasion, Canon also announced its plan to setup 8 exclusive pro-zones in India and 80 workshops exclusively based on wedding photography during the year 2010.The Zone concept is intended to reiterate Canon's commitment towards photography lovers in India. The pro-zones are expected to display an entire range of consumer, prosumer and professional cameras on the store front, where the customer is privileged to touch, feel and experience the digital SLR cameras with a combination of optical zoom lenses, accessories with expert hands-on guidance. Thus the customer can take home first hand information of the entire range of products and then make a buying decision. Four pro-zones are proposed to be set up in Mumbai, Pune, Bangalore and Hyderabad in the next 3 months. The workshops are planned to kick off as a series from the month of April 2010 starting with Ahmedabad and then taken to 37 other cities such as Baroda, Surat, Nasik, Pune, Jaipur, Ludhiana, Lucknow, Patna, Trichy, Coimbatore etc. The workshops are set to be conducted by famous names of the photographic fraternity of India with the focus solely on the theme of wedding photography. With this initiative, Canon aims to impart practical knowledge of photography among its target audience and promote photography to the next level. Speaking about the drive and initiative behind these workshops, Mr. Alok Bharadwaj added, “Weddings are the biggest festivals for Indians and to capture every moment in a daughter's marriage is every Indian's inner desire regardless of economic status. To enrich our users with these skills, we at Canon will be hosting 80 workshops this year, exclusively on wedding photography. 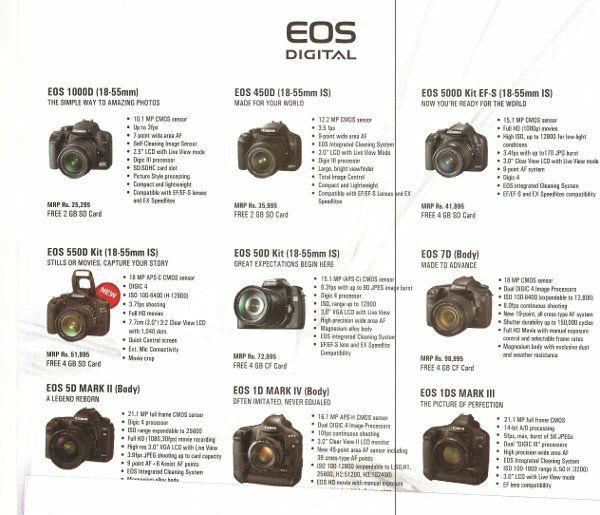 We will soon be setting up to eight exclusive pro-zones for EOS D-SLR buyers during this year to give users hands-on experience on the friendly technology”. The latest addition to the list of professional cameras launched today was EOS 550D in three versions with kit lenses. It redefines the limits of Canon's consumer DSLR range, by incorporating technologies and features more commonly used in semi-professional DSLRs into the compact, super-sleek, ultra-light body favored by the new generation. The Canon EOS 550D promises to deliver visually stunning stills and HD movies by offering the photography enthusiasts a powerful, versatile and user-friendly platform. The camera is featured to provide wide dynamic range and low noise. Being equipped with a 18 megapixel sensor, the EOS 550D is built to operate at high ISO sensitivity levels up to ISO 6400. The notable plus points of the camera include 1080p HD video recording (with full manual control), an 18MP CMOS sensor, 3-inch 3:2 LCD screen with 1040k dot resolution and the 63-point iFCL metering system. Canon estimates that the current compact digital market in India is worth Rs. 2000 crore (in other words, 20 lakh units). The compact digital market is expected to grow up to Rs. 10,000 crore or 10 million units by 2015. While the DV camcorder segment is currently estimated at 1,40,000 units & DSLR around 50,000 units in 2010. PC or next gen console? Which is the most handy app for the people who travel a lot?